This quick and easy creamy mustard sauce is perfect for fish, pork, ham, poultry, or vegetables. This sauce turns a basic chicken breast into an elegant entree impressive enough to serve your dinner guests. 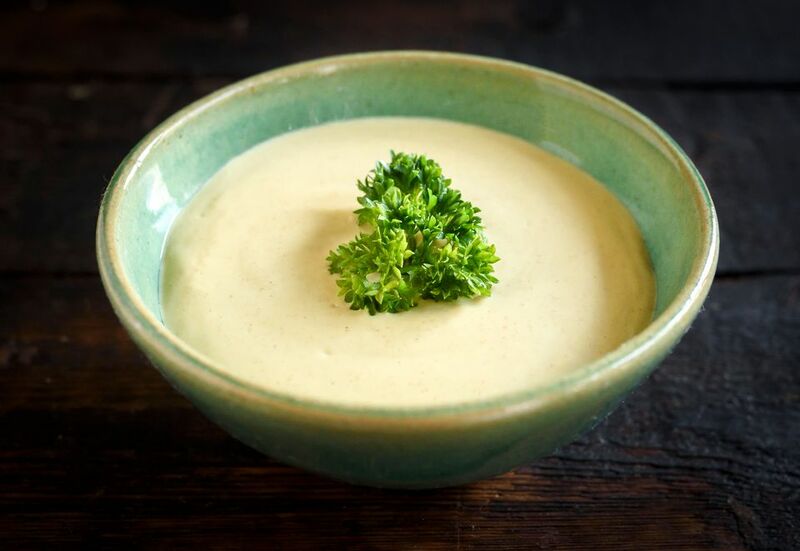 Perhaps this sauce was born out of the idea of the classic French Bearnaise—a sauce made from wine, vinegar, shallots, tarragon, egg yolks, and butter that is whisked and emulsified to create a velvety pale yellow sauce. In this recipe, the combination of heavy cream and Dijon mustard results in a similar smooth texture and a pale yellow color, but also adds a little bit of tang to the taste. Made simply from two ingredients (with salt and pepper to season), the sharpness of the mustard is counteracted a bit by the mellow flavor of the cream. You can change the sauce up a bit by adding a little grainy mustard in place of some of the Dijon. It will bring a new depth of flavor as well as an interesting texture. In a small saucepan, mix cream, mustard, and pepper over low heat. Simmer until sauce thickens slightly, stirring constantly, about 1 minute. Season to taste with salt. Use as a condiment, a dip, or in a marinade, and enjoy!